Identify Landmarks Around the Capital Region and Win! Clifton Park, NY- How well do you know your Capital Region landmarks? Well enough to win a diamond worth $1 grand? August 23, 2010 kicked off the Traveling Diamond Hunt. You have the chance to win a diamond worth $1000! Star 101.3, CDTA and Hannoush Jewelers want to give you a diamond. Don't worry you can qualify right up to September 10! Each weekday, check out the Star Morning Crew's Facebook page. There will be a picture posted of the hosts, either Ric or Brianne, holding the diamond in front of a mystery Capital Region location. Then tune in and listen for your cue to call. The first person to correctly identify the landmark qualifies for a chance to win a diamond! On September 10th, all qualifiers will ride the CDTA "Diamond Hunt run," which will travel Route 9 to Hannoush Jewelers in Clifton Park, and be part of a live broadcast. Those who qualify are asked to bring 1 guest, who will also have a chance in the grand prize drawing. The CDTA, Star 101.3 FM, and Hannoush Jewelers will also offer a wild card opportunity for one lucky contestant to get in on the drawing by just showing up at Hannoush Jewelers in Clifton Park on September 10th from 6:00-6:30PM. This promotion is to raise awareness of the new CDTA bus Route 409. It runs in Clifton Park along Route 9 between exit 9 of the Northway and downtown Saratoga Springs. 409 is now running and will serve the towns of Clifton Park, Halfmoon, Malta, and Saratoga Springs. Learn more! 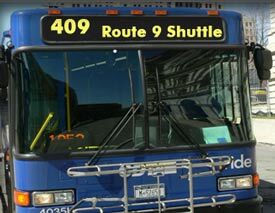 For more information on the bus route call the CDTA Customer Information Center at (518) 482-8822. For more information on the Traveling Diamond Hunt visit CDTA.org or star1013.com.